About four weeks ago the weather in our city switched from being nice and warm to blowing snow and freezing temperatures, all within a 24 hour period, and it hasn’t stopped snowing since. And as soon as it got cold outside the spiders and such, found their way into our basement because they were looking for a warm place to hang out. And if that wasn’t enough to “bug us” (ha…ha…), we bought some bananas from our local grocery store that had been shipped in from Guatemala, and suddenly we had nasty fruit flies everywhere. They are so difficult to kill because those things just seem to fly around in little circles, and out of nowhere a black fruit fly will fly past my computer monitor and the next thing I know I am beating on my monitor in the hopes of hitting the fly. 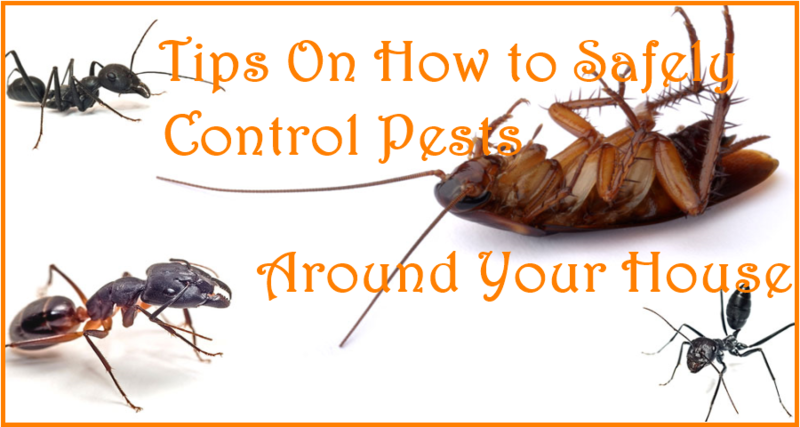 If having spiders, flies and other rodents in your home make you feel as uncomfortable as they make me, here are some tips on how to safely control pests around your house. Keep your kitchen very clean. Take out the garbage regularly and do not leave anything with sugar out on its own. In our case we had green bananas on our counter top, and the fruit flies seem to love them. As soon as they turned yellow, I peeled all of the bananas and froze them. As well, I quickly took the banana peels out to the garbage. Vacuum and dust the items in your basement frequently, and wash any floors with hard surfaces. Keep the area around your furnace and water drain clean. If you have items stored in boxes in your basement and they are just sitting on the floor, consider buying large Rubbermaid containers to put your things in and get rid of the boxes. Another thing we do to make it easier to clean the basement is to keep our items that are in containers on a cheap but sturdy shelving unit that you can buy at any hardware store. This way we can easily clean under the bottom of the shelves instead of having to move containers around to clean behind them. Do a walk around the outside of your house and remove any debris such as leaves, any odd branches, and any odd pieces of garbage that may have blown around your neighbourhood. The next thing we do and you may not agree with this, but, while wearing a mask and gloves we spray a pesticide outside on the foundation of the house, and around the bottom of all the doors. We do this as soon as it gets cold out and again in the spring. If using pesticides makes you feel uncomfortable you can always hire a company to do the spraying for you. Following these tips significantly reduces the amount of spiders and other bugs around our house which makes me feel much better. Now if it would only get warmer out. NextNeed To Save Money? Make Your Cellphone Work For You!